Surprising good animated version of the classic tale begins with a brief bit with brief bit set at Lewis Carol's college where he and Alice (and her sisters) meet various characters, including the Queen of England who end up as characters in Wonderland. 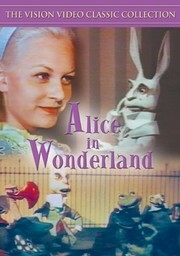 Once the story begins Alice interacts with the Wonderland characters who are all stop motion characters. It's a trippy tale that kind of reminded me of the big budget color spectaculars (The Red Shoes came to mind) that were produced in the late 40's and early 50's. This film was supposedly suppressed by Walt Disney whose own studio was working on his own version at the time and so has been difficult to see ever since. While the music isn't as spectacular as in other (Disney) versions, the film bests those other version in that it flows better. This is probably the first film version that I've seen where the story seems as if it's a single story instead of a group of loosely connected sequences. It may not seem like much but it really works wonders and for my money is the first version that satisfies me from start to finish. I know some people don't like the animation which is old school, but I like it since it adds a sense of other worldliness to the proceedings.